Today, I’ve been cleaning up my blog and taking small steps to make it more useful and accessible to readers. If you’re a frequent reader, you’ll probably notice me tweaking the layout and categories and tags in the coming weeks. For today, I was just reviewing some of my older posts, things I haven’t seen or thought about in years. This incarnation of my blogging life began when I started my current job a little more than two years ago, but I was blogging before that as a paraprofessional, as well. When I became a librarian, I had a lot of things to face up to right away. Not only was it my first job as a librarian, but I was alone as a branch manager in a new county with two teammates to supervise and really high expectations for how many programs I would provide each week. If you read my posts from the early days, bless you. I was struggling. HARD. My posts were about how overwhelming everything was and how I was making mistakes. SO. MANY. MISTAKES. I knew my blog was a kind of confessional and I thought that had some merit, too. Others were talking about their storytime plans, their visions for how youth services should be structured and valued, and how we can better the field. I didn’t think I had anything to contribute to that at first. I was twenty-five when I stepped into my big role as a librarian and I didn’t really know what I was doing. I just knew, even then, that no one should feel alone in that kind of confusion. So I wrote about it, all the while hoping it would mean something to some other lost newbie one day. As time went by, I got better and more confident. With big responsibilities to handle, I grew rapidly and now with just two years under my belt, I’m understanding and operating on a level that’s much, much higher than I would have if I’d been a low-level librarian in a big system among dozens of others just like me. My early years have been a trial by fire that forced me to find a way that was all my own. I realized that my work was broad and significant and deep as a small-town/rural librarian and that there wasn’t enough recognition in the world for this caste of librarians who compose roughly 80% of the public library field. So I started speaking to how my work varies from urban libraries and how powerful that can be. I understood that the way I was feeling–burdened and exhausted to the point of depression–wasn’t the way that anyone should feel in any career. I started sticking up for myself, saying no and negotiating lower expectations, asking for more staff. I started building relationships with my local peers and better ones with my co-workers. I was supportive and created a way for us to get to know each other. (The first SU local chapter.) When I did, I found that my co-workers came to my defense more readily. They listened to me in staff meetings and became my allies. My peers in other libraries shared their resources and knowledge and gave me a place to vent. They encouraged me. One day, I was surprised to feel that I had my own unique voice in the blogging world of librarians. I used it to lift up other people and to understand what kinds of needs existed. I started focusing on more school-age content, information about how to be a community builder in a small town, and child development. I volunteered to be a Joint Chief for Storytime Underground and was also selected as a director for my state’s youth services board. I’ve been trying to use both to connect people and make sure that no one needs to feel isolated. When I look back at those first posts from a couple years ago, I feel like a completely different person and part of me is embarrassed by how vulnerable I was. Still, I remember twenty-five year old Brytani fondly and I want better things for her and I’m leaving all that content, but hoping that no one needs it. A craft program called Totes and Quotes where we decorated tote bags and coffee mugs with quotes from the book. Today, I’ll share what you need to host a Totes and Quotes program for your adults. It’s a great way to extend on the experience of any book club and it has wide appeal for different ages. You could probably also do this with teens. First, you may want to search your local dollar and discount stores for plain white mugs and canvas tote bags. I got mine from Wal-Mart and my local Dollar Tree. Locating and pricing them ahead of time will help you come up with a budget and decide how many materials you can provide. I found it was really useful for this program to explain to participants as they were registering that this was process art, like making a painting, and wouldn’t have simple steps to follow for a set outcome. Some of our patrons are used to programs where crafts are made by following an example with provided materials and products are pretty much the same. Those people may have been uncomfortable with this program where they would need to imagine what they wanted and free hand most of the work. My experience with adults and art in library programs has taught me to think ahead about who programs appeal to and how to explain expectations. I started out by explaining how to use everything on the table. I introduced people to the paint pens, Mod Podge, and which brushes were best to use with the stencils. When it seemed like everyone understood the materials and how to use them, I just sat down at the head of the table where I was sitting with the other 5 participants and started planning aloud with the people around me. I started by picking my text and the sort of imagery that would go with it. I imagined my lettering and picked where elements would be on my bag. As I began, I encouraged the other participants and helped them plan, too. I gave them feedback and reassured them that no craft or artwork is perfect, but it’s all about the experience of making. My elderly participants struggled most, but shortly after they began, I could see them enjoying themselves more and more, even as they were making mistakes. I helped everyone correct anything they didn’t like by covering it with a stamp of paint or turning things into flowers. One thing I learned is that your younger participants will know what you mean by putting a quote on a mug or a bag. They’ll understand that the idea is to play with the lettering and use the words to make art. Your more elderly participants may not. They may take it more literally, and I think this is probably a divide in where these different generations find ideas for crafts. Those who surf Pinterest have seen typography and posters a lot. Looking back on it, I wish this had dawned on me beforehand and I wish I would have printed some images of quotes on coffee mugs or posters. The oil-based paint pens go on smoothly on ceramic mugs and mistakes are easier to remove there with hand sanitizer or rubbing alcohol. You can also apply small stencils to mugs, but words take a smooth hand. Your elderly patrons can always opt to just draw or decorate with stencils on their mugs if they have a hard time with lettering. If either are going to be washed in a washing machine or dishwasher, advise your participants to add a layer of Mod Podge when their design is dry. It will dry clear and help protect the paint from washing off or peeling. Your mugs should be baked at home at 350 degrees for 30 mins and allowed to cool slowly in the oven. I typed and printed these instructions, attaching as a tag to each mug with a string. Last year I talked a little about how I was asked for a Black History Month program and how my response proved to me that I wasn’t being the kind of ally I needed to be. I learned a lot from the experience of designing and facilitating a program on freedom quilts, but this year, I wanted to do something that wasn’t tied to slavery. I wanted a fun program with popular features that would be attractive to anyone, but just so happened to deal with a Black hero or African American history. In my pre-planning stage of gathering ideas, I remembered that Pixar has a new short film about John Henry. As I thought about it, it seemed like a program that could be based off a 10 minute, super fun video AND incorporating railroad/train activities could only be a hit for preschool and elementary-aged library users. After reading the description, I decided that I could fold in some of the findings from the book. I DID NOT read the book before I committed to doing the program. The description that I sent ahead for publishing in our newsletter mentioned that we would talk about some theories on the real person behind the tale. So, if you have read this book, you probably feel a hole forming in the pit of your stomach. If you haven’t, let me just tell you, it gets dark really quickly. More on that in a minute. I’m pretty busy all the time, so I plan my programs in stages. After the middle of every month, I do some very basic planning for what I’ll do the next month and I send a little description for the newsletter. A couple weeks before the program, I do the deep planning and buying of any materials I need. This time, I started planning way ahead because I needed to do research. I checked out books with several versions of the tale from nearby libraries, I read Ain’t Nothing But a Man, examined different versions of the folk song, researched the kinds of tools railroad workers used in the antebellum period, found folk music that reflected what railroad workers would have sung, and put everything into a presentation. Things got really difficult after I read Ain’t Nothing But a Man. You may have guessed this if you know anything about the John Henry tale, but the life of a former slave in the antebellum period was almost never good. 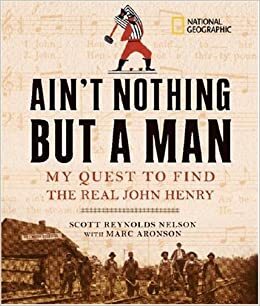 In the book, we learn that the man who was most likely the real John Henry was a teenager (probably no older than 15) when he was arrested a year after the Emancipation Proclamation for stealing from a grocery store. He received 10 years in prison as his sentence. While he was there, the warden made the decision to rent out the prisoners to railroad construction companies for working in the most difficult areas. John was sent to the Lewis Tunnel in northwestern Virginia, where the men were known to have actually raced a steam drill and won. However, it’s also recorded that more than 300 men died in making the tunnel, most from injuries and Black Lung. Our researcher found that John Henry disappears from work records after just a few years of working there and that the bodies of around 300 men were excavated from a mass grave in front of the old Virginia State Penitentiary. Well, &*@$. That’s a WHOLE lot to unpack. At first, I was almost ready to throw out the whole concept of talking about this book. How on earth could I make that appropriate for children? Then, I talked with a friend of mine, who happens to be Black. I confided in her that I was really wrestling with this material and was thinking about leaving out all the information from Ain’t Nothing But a Man and focusing on the hardships of railroad workers in general. She encouraged me to work through it. She gently reminded me that without people like me to help interpret this information for children, they would never, ever hear it. She asked me to think about what I learned in history class and what I’ve read in history books aimed at children. How many times did I see stories that handled the nuances of history from the perspective of the oppressed? I thought back and couldn’t think of one time in school when I had learned about the lives of slaves in any detail whatsoever. I’d never learned details of the civil rights movement or heard the names of any who died for basic rights, other than Martin Luther King, Jr. All of that happened much later, when I became an educator. Most children and teens will not learn these stories in school. Introduce the material by talking about how great the video is and how we’re going to learn more about the lives of railroad workers. Go through the presentation, pausing to listen to real music like what railroad workers would have sung, to look at some lyrics from different versions of the John Henry song, and to play a game where they’d make their own railroad. After the game, we’d dive into what I learned from Ain’t Nothing But a Man. Gently, skimming over the material and sticking to basic facts from the book, not the deeper social context. We’d see pictures of steam drills and I’d give a brief description of what we know about the life of the real John Henry without any graphic horror. We’d pause to reflect on that and to think about how different it is from the songs we heard and the video we watched. We could say how we felt about it. I’d wrap it up with my thoughts on why the folk tales, song, and even our video are still important. We’d end by doing a craft with 3-D paper trains and more fun music. Now, I live in the rural South and the populations I served are extremely White. I’ve observed racism in my communities firsthand, and I was still willing to grapple with this. However, I knew that the really hard stuff was going to depend on the audience I got. If most of the kids were preschoolers, than talking about dying probably wasn’t an option, but Parts 1-3 of my plan would still be fine. If I had mostly a crowd of kids ages 7 and up, I felt good about doing the whole thing. If you live in a more diverse community or your population is more liberal than mine, you may not have an issue with doing the whole thing with whatever audience you get. I got no one. No one came and all the preparation felt a little wasted. I’m still so happy I did it, though. I grew so much in the process. Here is my presentation, ready to steal. My notes are beneath the slides. This is the game for making the railroad. It’s a big line of packing paper, taped down at each end. The rails are pipe insulation that could be lined up, carefully made straight, and taped down by a team of kids. The area with the chairs is a tunnel for them to build in. If you think you’ll have a lot of kids, you could set up two of these in rows and have them race each other while you play a modern version of the John Henry song. I flagged a stack of books to share pictures during the presentation. What you can’t see here is that I also had giant post-it’s on the wall, where I’d written some of the lyrics from different versions of the song to share and to show how it changed over time. Here’s a folk song that you can let kids listen to and hear how railroad workers would have sung. It feels like it’s been forever since I wrote up a good school-age program. This year, my local school systems only have six teacher workdays. Couple that with a lack of space in one of my branches, and I’m just not doing as many as I usually do. Finally we had a workday roll around, though, so I’m back to one of my passions this week with a school-age program on Goosebumps! If you’re moving away from doing Halloween-specific programming, you might find that Goosebumps is a cheater’s road to avoiding a holiday program. Or, you know, just do it whenever you want like I did. It amazes me that this series has stood the test of time and it’s popular with so many ages. I have adults who check them out and love them! For this program, we only had a few in attendance but it attracted two 6th graders and one intrepid 3 year old. I still started off with this one, though it would have been way better with a few more people. One player ran to a chair at the end of the line, holding a straw in his mouth. My three year old assistant then added a plastic spider ring to his straw. He ran back to his teammate who also had a straw in her mouth and he slid the spider ring from his straw to hers without using his hands. After a couple times going back and forth, they decided it was too easy and he tried getting two spiders at a time. After taking turns, this ate up around 15 mins. Here players raced to blow their hollow, plastic eye into a cup taped to the end of the table. They used two paper towel rolls to direct the eye as they walked or ran around the table to keep it on track. They loved this game and probably played it the most. I chose a glow in the dark slime recipe, found here, and walked the kids through making it. With the older kids, I had them read out the instructions and measure everything while I just directed. With our youngest attendee, I helped mom add ingredients while little one stirred. I poured a little borax in a paper cup and put warm water in an insulated coffee pot on the table. Slime went home in snack-sized sandwich bags. Not surprisingly, it was the big draw to come to the program. This is actually a pretty clean craft as long as it’s properly supervised and you have the ingredients in child-friendly containers. The slime isn’t very messy once you handle it a little. I used vanilla pudding with a little green food coloring to make a blobby mixture in a couple big bowls. (It actually looks a lot like boogers.) While the kids were making slime, I set the bowls on a pad (you could use a table cloth) in case it splashed out of the bowls. The kids stood back and tried throwing the eyes into the bowls. Incredibly, they all came up with a dozen ways to play this game. The older kids tried bouncing it between the lines from our relay or throwing it under a leg. Our littlest player tried a scattershot approach and threw a whole cup of eyes in the general direction of the bowls. She was surprisingly good. Kids just had to wipe off the eyes before playing again so that they wouldn’t drip. There it is! It’s really simple and something that you can do with low prep time, low budget, and minimal space. I think I spent about $30, but I had some items like food coloring, tableclothes, cups, and glue. In my last post on four-eight month old infants, I’m addressing a beautiful thing called object permanence. Parents probably know this as the concept that helps their babies not to go BANANAS when they leave the room or turn a corner and disappear from sight. Object permanence is the knowledge that something is there even when we can’t see it, and it’s just beginning to form at the tail end of this stage (right around seven or eight months). Object permanence is what makes peek-a-boo such a fascinating game for babies. When you hide your own face, infants will think you’re completely gone. You are a sorcerer to them–a regular Chris Angel, Mind Freak. When you move your hands away, suddenly you’re back from outer space and you just walked in to find…never mind. Practicing peek-a-boo gives infants a fun opportunity to explore a parent’s whole tangible being. It helps them build the knowledge that they’re not being left when they can’t see someone and it might help them trust that they’re always coming back. There are so many opportunities for this in storytime! Try any version of Little Mouse, Little Mouse. Jbrary has a great listing here. Remember, some babies may not have 20/20 vision yet (especially if you have some younger than six months). I like to make my baby flannel sets really big. I have one Little Mouse set that’s just three bright houses that are a little bigger than softballs. Sometimes I play the game with the mouse half out of the house or with its tail sticking out. Here’s another peek-a-boo song from Jbrary that I use from time to time. I love Kendra’s “Where is Baby?” I use it to end every baby storytime and it’s a hit for all ages. There’s also this whole storytime from Brooke! While searching for some resources, I also found this chart from Saroj Ghoting, which has lots and lots of info just like what I’m sharing in this series. Check it out!